Artists and painters will probably be attracted to this one. 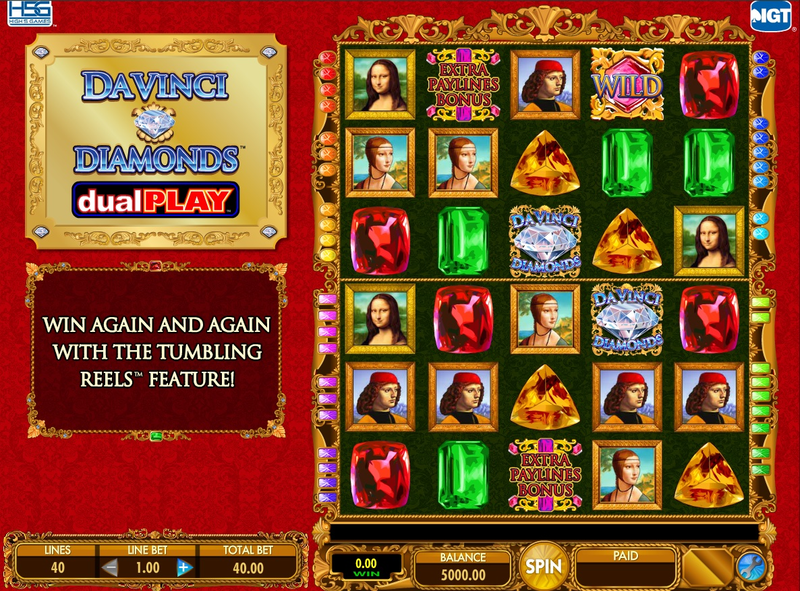 DaVinci Diamonds was developed by IGT (WagerWorks) and brings with it the high culture of the Renaissance. This slot has 20 paylines and while it’s getting up there in age, still looks acceptable graphically today, though, it wouldn’t hurt to give it a new coat of paint or a complete overhaul to help give this popular slot more life. You probably won’t believe this, but the bonus symbol is the one with “bonus” written on it. Listen, we just have to state the obvious sometimes so just bear with us. It’s appreciated. Anyway, nailing a bonus symbol on lines 1, 2, and 3 will trigger the free spins feature which we’ll talk about in a second. Scoring five of the Mona Lisa paintings will see you getting 1,000 times your bet. With this review, we’d like to talk a bit more in-depth about two bonus games you can trigger while playing DaVinci Diamonds. The first one: Tumbling Reels. Essentially, the way this works is at the point you score a winning combination, the symbols that were involved in that win will disappear and then to fill in the gaps, new symbols will fall into place. The cool thing about this feature is you could create even more winning paylines and net yourself a bigger win. The second feature is the free spins feature. We touched on this briefly already, but when you get the bonus symbols on the 1st, 2nd, and 3rd reels, you’ll trigger the free spins bonus. To make up for not having new multipliers, the Tumbling Reels feature is active and this bonus game can be retriggered. Keep in mind that the amount of spins you get will depend on your winning line that triggered the bonus game itself. While it’s getting up there in age and it’s wrinkles are showing, we don’t think that should distract you from the great slot this is. With a nearly 95% return-to-player rate, a lot of people are playing and a lot of people are having fun. Why not click here to start playing?